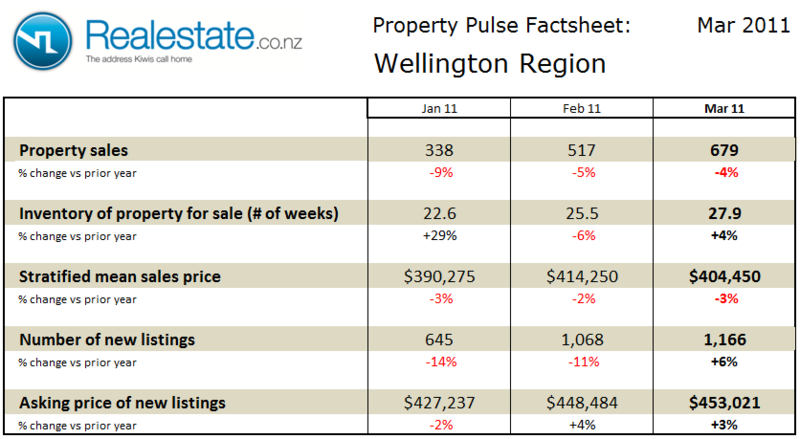 The Wellington region property pulse factsheet for July 2012 is published using data from Realestate.co.nz and REINZ (Real Estate Institute of NZ). Property sales across the Wellington region at 549 in the month rose on a seasonally adjusted basis in July and are up 16% as compared to a year ago. The inventory of unsold houses on the market rose slightly to 21 weeks of equivalent sales. This continues to see the inventory of unsold houses below the long-term average of 23 weeks of equivalent sales. 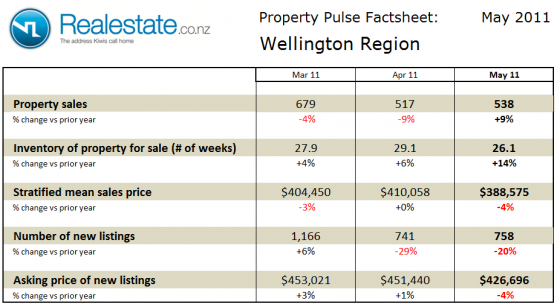 The stratified mean sales price of properties sold in the Wellington region at $406,650 was up just 1% compared to July last year, over the longer term the trend has been a fairly flat. The asking price expectation of new listings was up just 3% as compared to a year ago at $442,590. The level of new listings coming onto the market in July at 763 was down as compared to June, but up 15% as compared to a year ago. 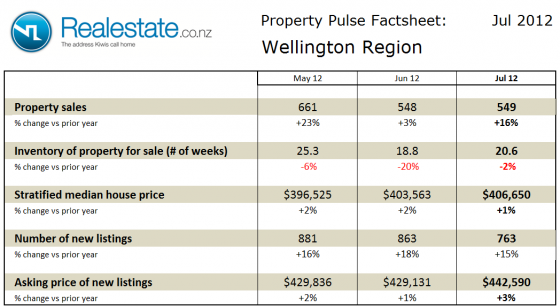 This data indicates that the Wellington region remains in a seller’s market. The rate of sales is still strong and overall inventory is low providing buyers with limited choice. Set against this situation there is a steady flow of new listings and prices do not show any significant appreciation nor are sellers setting high selling price expectations. 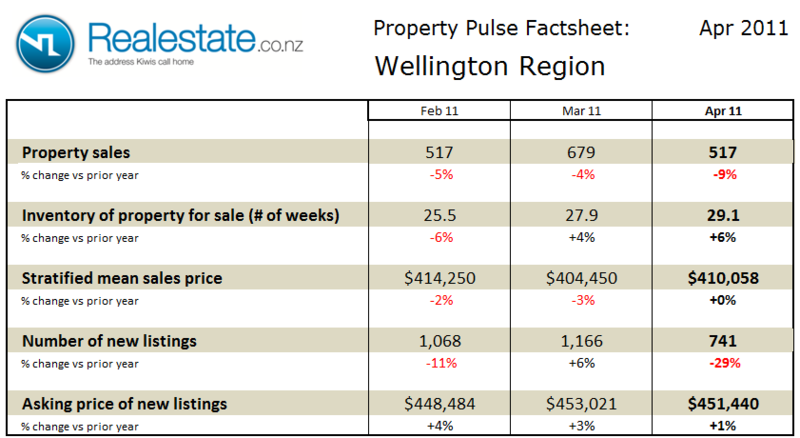 The Wellington region property pulse factsheet for June 2012 is published using data from Realestate.co.nz and REINZ (Real Estate Institute of NZ). Property sales across the Wellington region at 548 in the month fell on a seasonally adjusted basis in June but was up 3% as compared to a year ago. The inventory of unsold houses on the market fell to 19 weeks, reversing a rise seen in May, this takes the level to again below the long-term average of 23 weeks of equivalent sales. 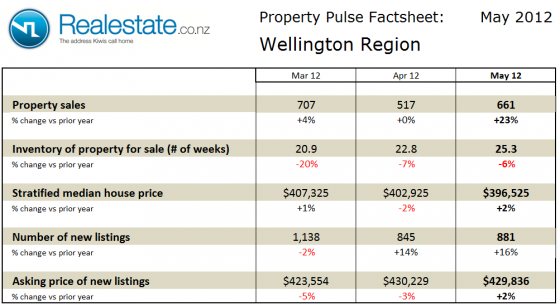 The stratified mean sales price of properties sold in the Wellington region at $403,563 was up 2% compared to June last year, the longer term trend has been a fairly flat performance in selling price over the past 2 years. The asking price expectation of new listings was up just 1% as compared to a year ago at $429,131. The level of new listings coming onto the market in June at 863 was down as compared to May, and up 18% as compared to a year ago. 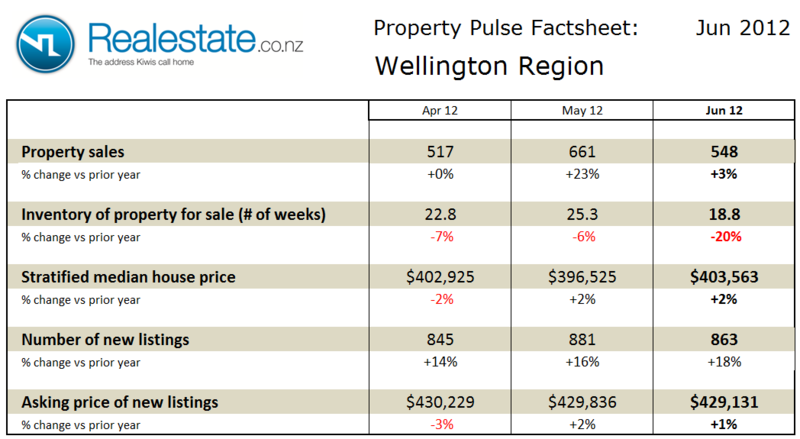 The Wellington region property pulse factsheet for May 2012 is published using data from Realestate.co.nz and REINZ (Real Estate Institute of NZ). Property sales across the Wellington region at 661 in the month rose significantly on a seasonally adjusted basis in May and up 23% as compared to a year ago. The inventory of unsold houses on the market rose to 25 weeks, this takes it slightly above the long-term average of 23 weeks of equivalent sales. The stratified mean sales price of properties sold in the Wellington region at $396,525 was up 2% compared to May last year but continues a recent easing. The asking price expectation of new listings was up 2% as compared to a year ago at $429,836. The level of new listings coming onto the market in May at 881 was up compared to April, and up 16% as compared to a year ago. 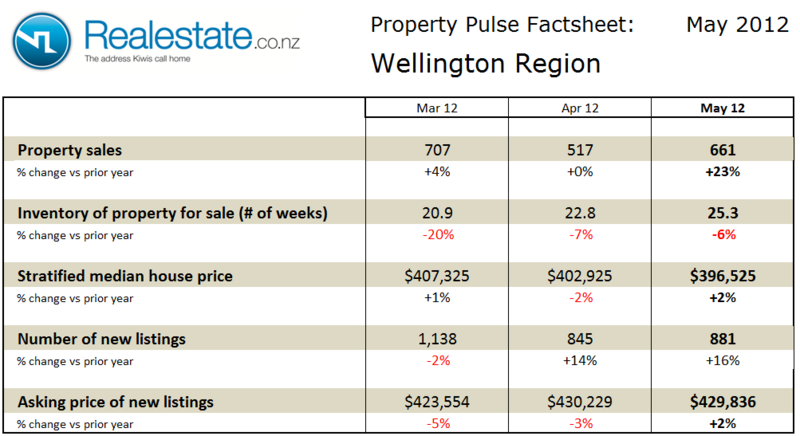 The Wellington region property pulse factsheet for November 2011 is published using data from Realestate.co.nz and REINZ (Real Estate Institute of NZ). Property sales across the Wellington region at 615 in the month rose on a seasonally adjusted basis in November and exactly the same volume of sales as compared to a year ago. The inventory of unsold houses on the market remained stable at 23 weeks, this takes it slightly above the long-term average of 22 weeks of equivalent sales. The stratified mean sales price of properties sold in the Wellington region at $412,925 was flat as compared to both last year and prior month. The asking price expectation of new listings was down 1% as compared to a year ago at $448,225. The level of new listings coming onto the market in November at 1,178 was up compared to October, and up 6% as compared to a year ago. 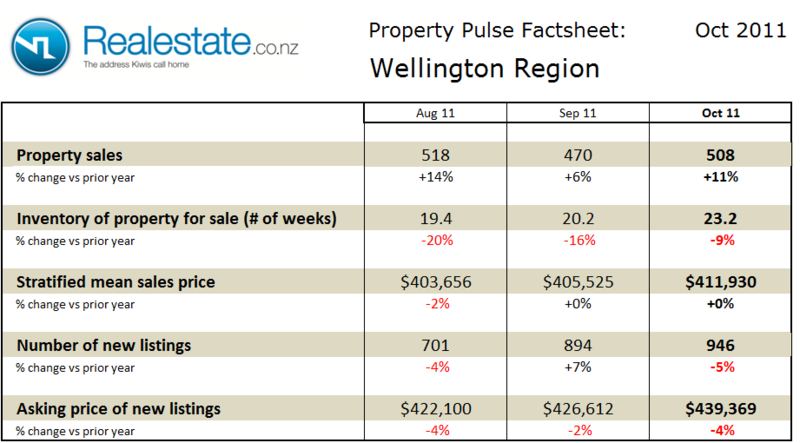 The Wellington region property pulse factsheet for October 2011 is published using data from Realestate.co.nz and REINZ (Real Estate Institute of NZ). Property sales across the Wellington region at 508 in the month rose slightly on a seasonally adjusted basis in October and was up 11% as compared to a year ago. The inventory of unsold houses on the market rose to 23 weeks having fallen for the past few months, this takes it slightly above the long-term average of 22 weeks of equivalent sales. The stratified mean sales price of properties sold in the Wellington region at $411,930 was flat as compared to a year ago but up from the prior month. The asking price expectation of new listings was down 4% as compared to a year ago at $439,369. The level of new listings coming onto the market in October at 946 was up compared to September, but down 4% as compared to a year ago. 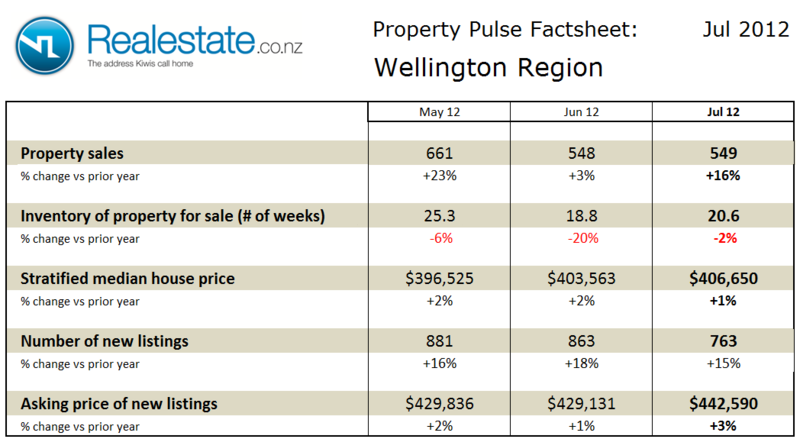 The Wellington region property pulse factsheet for May 2011 is published using data from Realestate.co.nz and REINZ (Real Estate Institute of NZ). Property sales across the Wellington region at 538 in the month fell slightly on a seasonally adjusted basis in May but were up 9% as compared to a year ago. The inventory of unsold houses on the market fell to 26 weeks to remain above the long-term average of 22 weeks of equivalent sales. 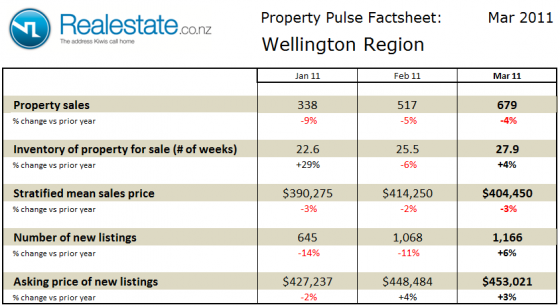 The stratified mean sales price of properties sold in the Wellington region at $388,575 was down by 4% as compared to a year ago and showed a similar fall from the prior month. The asking price expectation of new listings was down by 4% as compared to a year ago at $426,696. The level of new listings coming onto the market in May at 758 was up slightly as compared to March and down 20% as compared to a year ago. 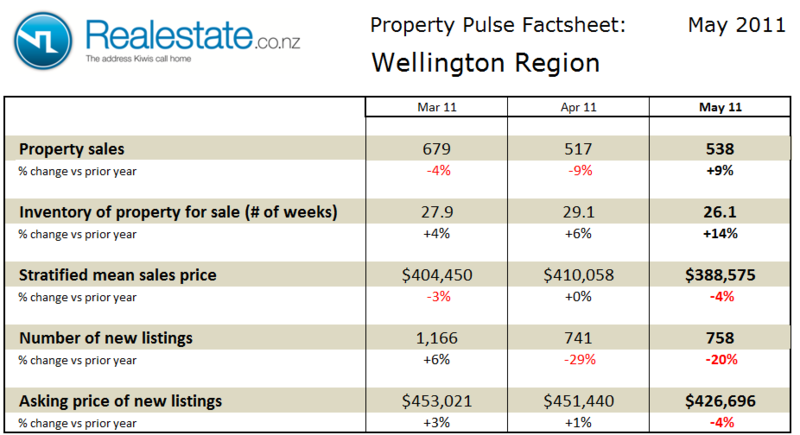 The Wellington region property pulse factsheet for April 2011 is published using data from Realestate.co.nz and REINZ (Real Estate Institute of NZ). Property sales across the Wellington region at 517 in the month fell on a seasonally adjusted basis in April and were down 9% as compared to a year ago. The inventory of unsold houses on the market rose again to 29 weeks to remain above the long-term average of 22 weeks of equivalent sales. The stratified mean sales price of properties sold in the Wellington region at $410,058 was flat as compared to a year ago but up from the prior month. The asking price expectation of new listings was up slightly by 1% as compared to a year ago at $451,440. The level of new listings coming onto the market in April at 741 was down significantly as compared to March and down 29% as compared to a year ago. 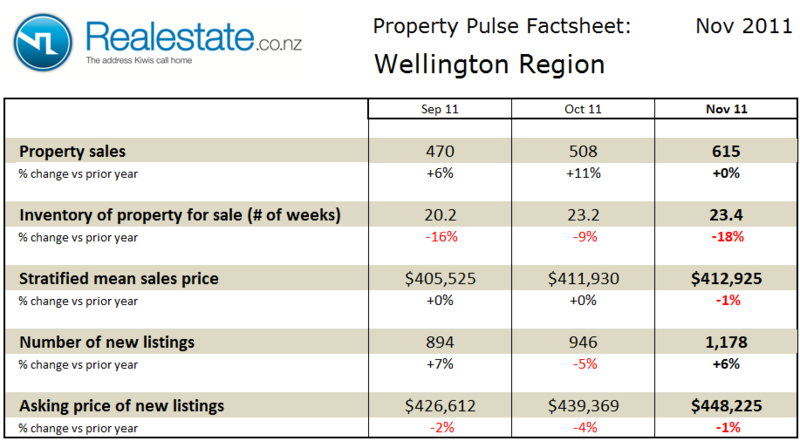 The Wellington region Property Market factsheet for October 2010 can be downloaded by clicking this icon. 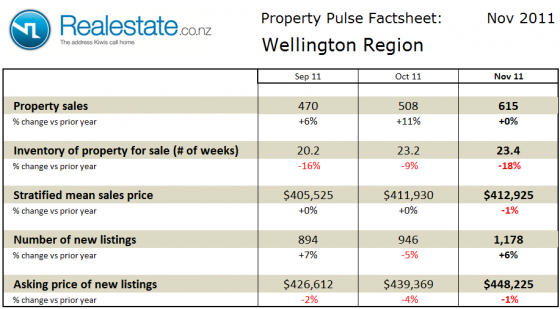 Property prices in the Wellington region as measured on a stratified basis fell in September to $403,595. As compared to a year ago prices are down 0.3%. Property sales measured on a seasonally adjusted basis fell by 1.5% from August. There was a total of 445 property sales in the month. Over the first 9 months of 2010 a total of 4,507 properties have been sold, this compares with 5,246 in the same period in 2009. Inventory of houses on the market remains stable at the current level of 24 weeks of equivalent sales. This is slightly up on the long term average in the region of 21 weeks. In overall terms the property market across Wellington remains fairly well balanced with a slight leaning in favour of buyers. The Wellington district Property Market factsheet for August 2010 can be downloaded by clicking this icon. Property prices in the Wellington region as measured on a stratified basis fell further in July to $398,025. This is the 5th consecutive month of price fall from $423,675 in February. As compared to a year ago prices are up 1.1%. Property sales measured on a seasonally adjusted basis increased by 8.7% from June. There was a total of 471 property sales in the month. On a moving annual basis sales are up 5.5% with 6,637 properties sold in the past 12 months compared to 6,289 in the prior 12 months. Inventory of houses on the market rose again in July. The current level of 25 weeks of equivalent sales is up on the long term average in the region of 21 weeks. In overall terms the property market across Wellington is inching towards a buyer’s market.